Lili Shubert helped Trego to a fourth place finish in 2A. 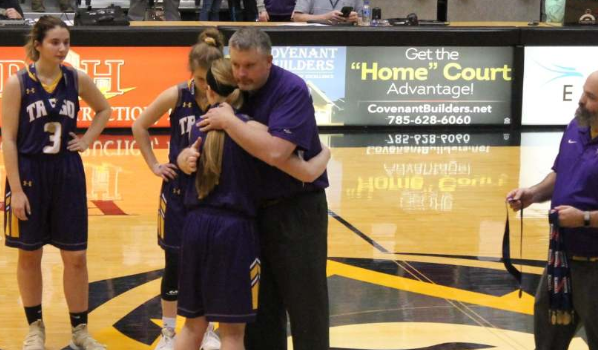 WaKeeney-Trego Community sophomore Lili Shubert and her father, coach Donnie Shubert, led the Golden Eagles’ girls basketball team to its best showing in 42 years. Before this season, Trego girls had made three all-time state appearances, in ’77, ’03 and ’05, according to longtime Kansas historian Carol Swenson. 1977 marked the only time the Golden Eagles had won a state game with a third-place finish in 2A. Last year, Shubert replaced Jerod Brown, a well-known local pastor and Rule 10 coach, as head coach. Shubert had captured a state title in 2006 with the Wakeeney boys and had coached many of the girls in younger ranks. In 2017-18, Trego girls had a big improvement to 15-7. As a freshman, Lili led with 12.8 points and 6.2 rebounds. This year, behind a squelching defense, the Golden Eagles went 20-5 and finished fourth in 2A. Trego, with a very non-senior team, was unranked to start the winter but eventually ended the regular season No. 1 in a close classification. In December, the host Golden Eagles won their own Purple and Gold Tournament for the first time. Trego took second to Norton, a final four team in Class 3A, in the Mid-Continent League midseason tournament. At state, the second-seeded Golden Eagles opened with a 49-33 victory against Johnson-Stanton County. Then, WaKeeney lost, 67-49, to Sterling and fell 49-36 to Alma-Wabaunsee in the third place game. Lili Shubert upped her numbers to 15.4, seven rebounds and 2.5 assists a contest this winter, all team-highs. She was the team’s only player to average double figures. “She works hard, and you have got to give the team a lot of credit for getting her the ball when she is open,” coach Shubert said. Shubert paced the team with 22 treys and led with 78 percent free throw shooting (min. 11 attempts). “It’s been a great bond, but it’s also tough,” coach Shubert said. “It’s hard to distinguish between being a dad and a coach. They have to listen to me for two hours a day. “She has to listen to me for 24 hours a day,” he said with a laugh. Junior Libby Frost was the next scorer with nine points and 4.4 rebounds a game. Frost had several standout performances, most notably 22 points versus Smith Center and 19 against Thomas More Prep-Marian. Versus TMP, Frost went 6 of 6 from the field and 6 of 6 from the foul line. “Leadership, always willing to sacrifice scoring on the offensive end to take on their best player,” coach Shubert said. Sophomore Tillie Malinowky battled injuries but delivered 5.3 points and 4.1 rebounds along with a team-best 1.5 steals a contest. Shubert, Frost and Malinowsky, who were the team’s top three players as freshmen, helped the Golden Eagles collect 34 percent of available offensive rebounds, a strong rate. Trego’s man-to-man defense, though, was its hallmark. The Golden Eagles permitted just 35.2 points per contest. On a per-possession level, the numbers were even better. Trego averaged 57.7 possessions per game and allowed just .608 points per possession. Garden Plain, the 2A champion, permitted .733 points per possession. WaKeeney had five players average at least one steal a contest and delivered 7.6 steals and 1.4 blocks a contest. Against Stanton County, the Golden Eagles held the Trojans to 22 percent shooting, including 2 of 14 from inside the arc. Shubert led the squad with 14 points and five rebounds. In the semifinal loss to Sterling, Shubert finished with a game-high 23 points. In the third-place game, Shubert had 12 points and 10 rebounds, again both team-bests, and helped Trego limit Wabaunsee to 36 percent shooting. Shubert collected a bevy of awards, including 2A all state tournament team from Sports in Kansas. Shubert earned second team Class 2A by SIK – and was the only 2A sophomore to earn first or second team honors. “Strong kid who hit the glass hard, and it’s a tough matchup for a lot of people,” Wabaunsee coach Shanna Perine said of Shubert. WaKeeney is expected to be one of the favorites next year, too. Trego graduates just two seniors, point guard Adrianne Carr, and reserve Paige Post. In February, Carr signed to play volleyball at Kansas Wesleyan. As a junior, Carr was the school’s Athlete of the Year, is a powerlifiting record holder and also a Wendy’s High School Heisman Winner for Trego. Carr averaged 2.1 points, 2.6 rebounds and an assist per contest. Post played in 11 contests and delivered 0.9 points and 0.8 rebounds. The Golden Eagles had 95 percent of their points and 92 percent of their rebounds from non-seniors. As well, juniors Gracie Pfannenstiel and Hannah Kinderknecht, sophomore Emma Day and freshman Madison Walt were key players.